Ngan said she hopes that the two sides will continue coordinating closely to organize the 10th meeting of the committee within the year, and work out solutions to boost bilateral affiliation. The Vietnamese NA leader also proposed that the two sides work harder together to complete the target of 2 billion USD in trade. She suggested that the two countries prioritize the trade of each other’s strong products, deal with payment problems to support trading activities, encourage businesses of both sides to study each other’s market, and promote trade and investment partnership. 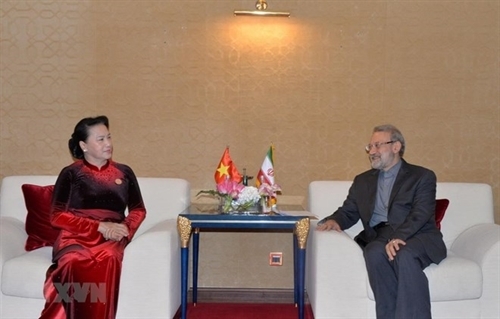 He added that following his return, he will discuss with the Iranian Minister of Culture on the organization of cultural days in each country, and suggested that Vietnam and Iran increase the import and export of fruits and farm produce to each other’s market, paying more attention to agricultural cooperation.